It can be hard to take good photographs of dogs at play. As you approach to snap an action shot, dogs tend to stop whatever adorable game they’re engaged in, ending that perfect photo-op. That’s why it should come as no surprise that one of the best canine photographers out there is, herself, a dog. 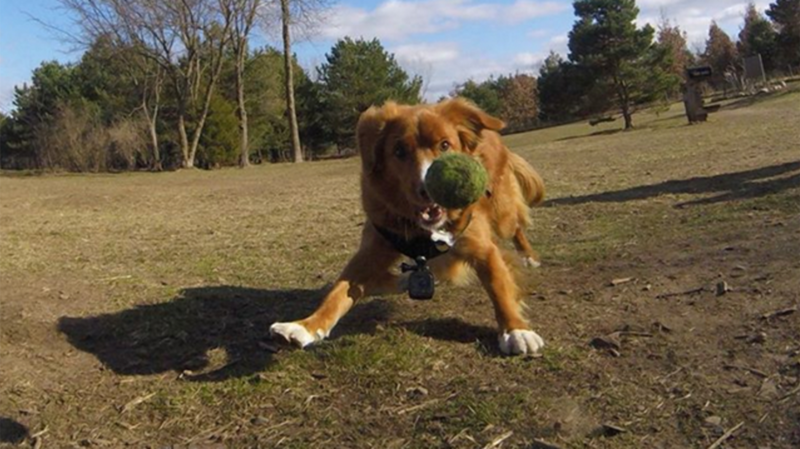 Tula, a 4-year-old rescue dog, has been snapping candid photos of her friends at the dog park, and they are being posted to the Instagram account Canine Happy Hour with the help of her human family, the Kixmoellers of White Bear Lake, Minnesota. The Washington Post reports that 17-year-old Susie Kixmoeller was having trouble getting candid shots of Tula and her friends at the park, so she strapped a GoPro camera to Tula’s chest. She set the camera on time-lapse mode, which allowed Tula to automatically snap thousands of photos as she ran around with her canine pals. Blown away by the photos, Kixmoeller started the Canine Happy Hour Instagram page to share them with the world. Now, the entire Kixmoeller family spends hours wading through Tula’s GoPro photos, choosing only the best ones to share on Instagram. Tula’s photos are alternately majestic and ridiculous, showing her canine companions wading through rivers, jumping through the air, or goofily rolling around on the ground. They capture dogs in moments of unselfconscious play, revealing up-close a completely canine world that humans rarely get to see. Check out a few of our favorites below.